It’s not secret that Richard Rogers and Oscar Hammerstein shaped American musical theater, and thereby musical films. 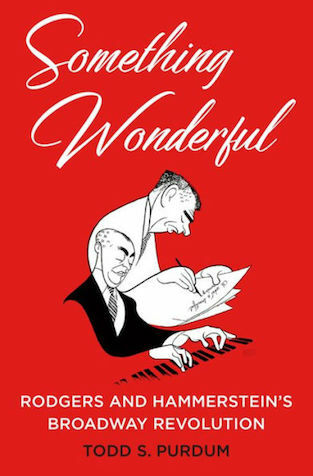 In this delightful new book, Something Wonderful: Rogers and Hammerstein’s Broadway Revolution, their personal lives as well as their professional collaborations combine to form a well-rounded look at the men and their legacies. Throughout the pages, readers get insight into how the songs we know and love came to be. And there are plenty of instances where the lyrics are printed out. It’s impossible not to sing the songs when reading the lyrics. This book is like an interactive experience. One of my favorite stories is South Pacific. Reading how the story came to be from the collection of stories, Tales of the South Pacific by James A Michener, and then how the production came to be is an interesting story in itself. Then, learning how the songs came together is the icing on the cake. The two men made history and even won a Pulitzer Prizes. Their shows broke Broadway records. Whether you are interested in the personal quirks of the men (Hammerstein was stingy), their marriages, or their working relationship, it’s all in this book. This is the quintessential book about Richard Rogers and Oscar Hammerstein.